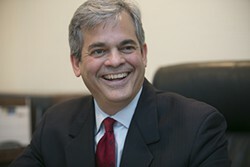 (Community Matters) Proud of Mayor Steve Adler for floating a strawman then responding quickly and responsibly to public & colleagues’ input. As a result, the Mayor has pulled off the table the idea of raising civic funds through a foundation. Instead, he and the City Manager have identified unfilled and already funded City of Austin positions which can transfer to the Mayor’s office. Existing mayor staff can handle the day to day work; we’re talking about 4 to 5 additional staff members to help Steve tackle the bigger problems facing Austin – affordability, traffic, education and water. City of Austin residents very decisively said we want a new way of doing business, we want a council that can better handle these big problems, and we want better results. We’re holding this mayor responsible for his campaign promises to deliver. We sure as hell intended for City of Austin resources to be deployed in this manner. With 885k constituents, the Mayor currently has 1 staff member for every 177k constituents; council members have 1 staff member for every 30k.